What is happening to the District’s middle class? If you look at D.C.’s local income tax data, you might say the middle class is shrinking—or you might say it’s booming. It all depends on how you define middle class. We’re not going to delve into the fraught debate of what it means to be middle class (though you can get some perspectives from the NYT, EPI, and Pew). What we’ll do is present the data and let readers make their own conclusions. From 2001 to 2012 the number of families (married couples or singles with dependents) filing income taxes in the District with incomes between $20,000 and $80,000 decreased or barely grew, while the overall population increased by about 60,000 residents. According to tax data most of this population increase was driven by childless single people with incomes under $100,000. The number of married couples making over $100,000 grew, but in smaller numbers than childless singles making under $100,000. This is probably because married couples make up a much smaller portion of D.C. taxpayers than singles. When we look at percent growth instead of growth in raw numbers we see a more nuanced story. The graphs below show that even though in raw numbers the increase in families making over $100,000 is modest, the increases percentage-wise are quite large, especially for those with incomes in the low to mid $200’s. 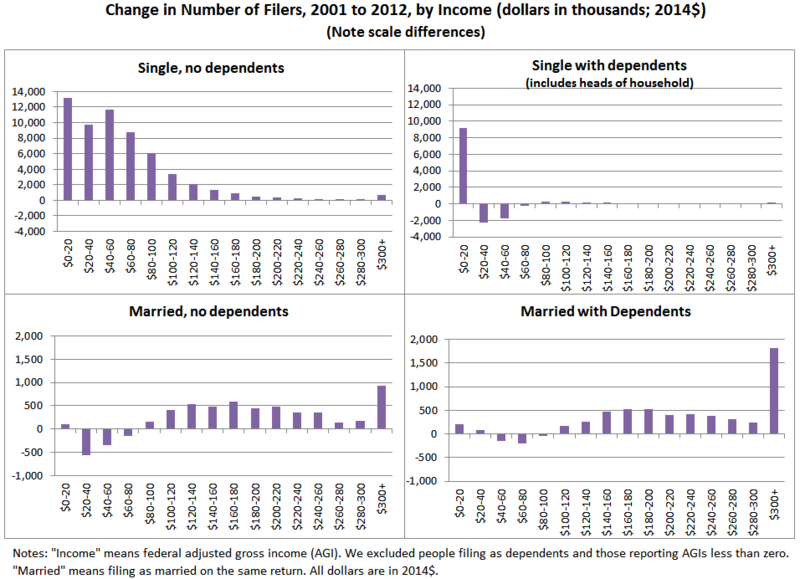 There’s also been a sizeable increase in the lowest income filers (those making below $20,000), especially among singles with dependents. This might be due to more people in this category filing taxes and not necessarily more of these folks moving into they city. The earned income tax credit (EITC) was expanded during this time, according to the DC Fiscal Policy Institute, so that might have caused more low-income people to file taxes. We’re curious to see how our readers interpret these numbers.